A poet, a writer, a musician, a photographer. 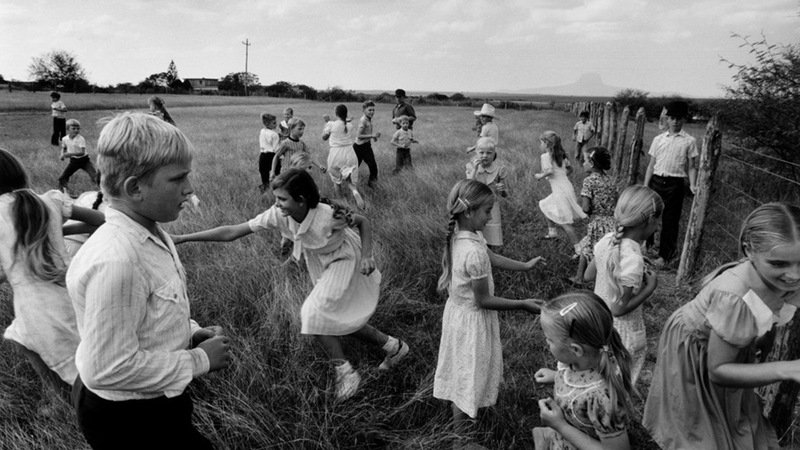 Larry Towell is a creative soul who graces us with his images and accompanies us with a reason through the stories that he chooses to tell. When I was Archive Director at Magnum New York many years ago, I clearly remember the days when photographers, who did not live close by, came to visit the of ce and spend a few days. It was always about work of course, but also about encountering those human beings that we got to know on a daily basis through their images. Larry’s trips to New York were my favorites. He would walk in with a soft smile and always automatically create a familiar and peaceful atmosphere around the of ce. His roundish glasses, his ubiquitous straw hat and suspenders were the signature style. And some things don’t change. The hat, the suspenders, as well as a declared preference for lm without refusing new technologies and media, and the irreplaceable love for darkroom printing. Larry’s glance and vision, whether in war or at home, is full of compassion and care. People are important, their story is important. And that is what he clearly wants to tell. Human rights, injustice, social turmoil, disinformation, power unbalance, displacement, resilience are themes that have triggered and keep inspiring his storytelling. Issues of identity and loss, love and family, land and landlessness are at the heart of his vision. Long-term commitment which allows a deep knowledge of people and places is key to his work. Respect and attention are part of his vocabulary. And a strong stance on the what’s and why’s transform his poetic images in manifestos for justice and hope. Larry’s rare qualities, being humble and inspirational on many levels, are paired with an unequal natural instinct for composition, balance and light. When images are beautiful we want to look at them; when they are extraordinary we really linger on every detail and gesture; and that is when we are hit by the content, the profound meaning, the voice behind the image. And it is the victim speaking, the soldier crying, the mother whispering, always accompanied by Larry’s words. His songs, his poems and his soul are in his pictures.